Damascus, Maryland, April 1, 2019 – Woodfield Commons invites you to join us on Saturday, April 6, 2019 from noon – 4 pm for our Grand Opening Open House at 26390 Woodfield Road, Damascus, MD 20872. Come take a tour of our brand new, energy efficient one, two- and three-bedroom apartment homes, the community’s clubhouse, fitness room, computer lab, laundry center, and grounds! Come listen to live music by local Damascus trio, the Acoustic Chicks from 1 – 3 pm and enjoy food catered by local establishment, the Hornet’s Nest Grille! Woodfield Commons is perfectly located in the town center of Damascus in Montgomery County adjacent to the Damascus Center and Post Office. This brand new, energy-efficient apartment community offers its residents contemporary designer finishes, with many desirable amenities and green space. Residents will enjoy a variety of nearby local amenities, including schools, shops and restaurants. 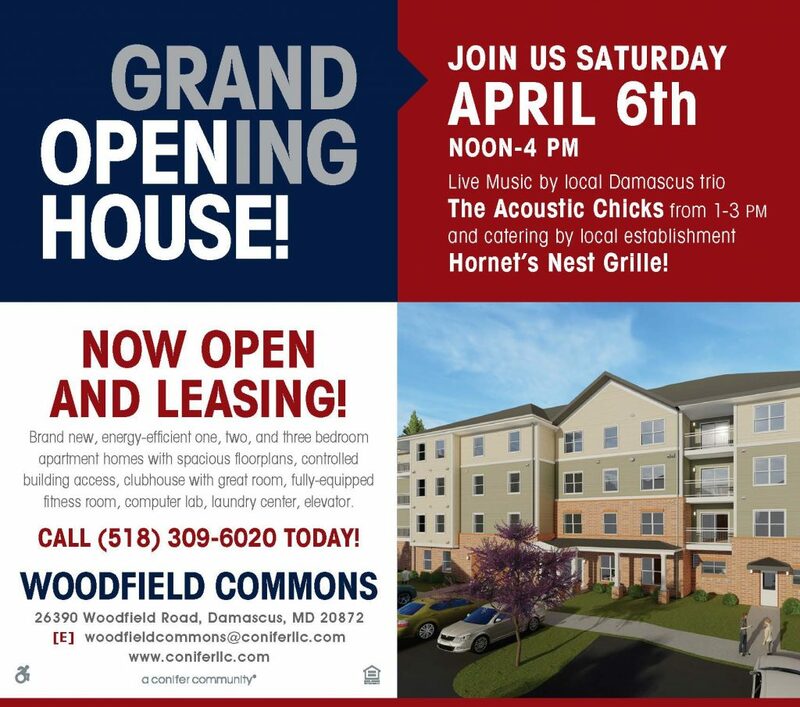 Come join us at our Grand Opening Open House on April 6th and picture yourself living at Woodfield Commons! If you are interested in this housing opportunity and want to learn more, please call (518) 309-6020 or visit www.woodfieldcommons.com for more information and to download an application.